A wealth of detailed information that is without equal! This is a meticulously-researched reference guide to 300 shipping losses, and the events surrounding their sinking, off the coast of Scotland from Berwick-on-Tweed to the Forth and Tay, and northwards to Stonehaven. This new book is a very much improved and updated edition of the successful previous edition, Shipwrecks of the Forth, and benefits hugely from the vast amount of vital new information gleaned by the author during 15 years of painstaking research. Each wreck is listed by area with details of position, history and fate. The text is accompanied by maps and charts and illustrated with many dramatic photographs. As a result of this meticulous work, exciting discoveries and recoveries such as ships' bells and pottery have been made by divers, allowing them to confirm identities of previously unknown wrecks. In addition to first-hand local knowledge of fishermen, coastguards, lifeboat men and divers, the author has consulted primary sources including official records from the Admiralty and Lloyds, official German U-boat records and Norwegian, Swedish and Danish records. Many vessels were lost due to running aground or collisions but the vast majority of shipwrecks immediately surrounding our coasts resulted from military activities during the First and Second World War. As such this aspect of the book provides significant historical interest for readers. 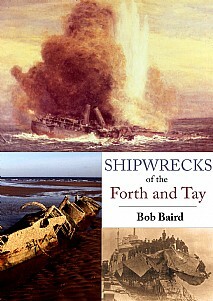 Shipwrecks of the Forth and Tay will be indispensable to divers wishing to explore these wrecks; it will also attract anyone who loves the sea and ships, who has an interest in this area of Scotland, maritime history or anyone looking for an informative read.